Asking for the salary history of your employee might not be the easiest thing to do, especially since it is about money and most people shy away. Even though it is not all that compulsory, I am sure you have reasons for asking for it. In case you don’t know how to go about the procedure, this article will surely help. So without any further delay, let us tell you how you may ask your employer for their salary history. So what does salary history means? Before we go deeper into the article, it is first important for us to understand what salary history means. A salary history is usually a document that gives you an estimate of the past earnings of your employee. There are some who tend to ask most of their candidates to give them a sort of history of their salary when they are applying for the job. The salary history will also have the name of the company, the salary they have had all these years, the job title as well as the benefits which the candidate made have earned in the past few years. How to ask for salary history? There are several people who fill in a job application without even giving it a second thought? This of course does not mean that they are bad or good candidates. It is also not that important for them to keep this kind of information as a secret. So if you have to ask them their salary history, this would be the right way to go about it. You should also speak to those candidates on a regular basis, keep in touch with them and tell them that you are keen on knowing the history of their salary and that you would like to see them as candidates. If they are trying to avoid it, then just tell them straight up that you need the information and that further processing cannot be continued if the information is not given. You have to be very straight forward in situations like these, especially if you want them to give you the information. If your candidates are not listening to you, then it’s high time you say no to them and let them part their own ways. Because having the history of the salary would be equally important to you we are sure. Plus you don’t want to deal with someone who is that stubborn. So kindly keep away from people of that sort and simply reject the ones who do not comply. Your problems would be solved in that way and you will have nothing to worry about. You can instead focus on those who matter. How can you handle a request of the salary history? If you have been asked to mention and include the salary history along with the resume, you may but if you want ignore this it would also mean that you will not be getting any interview. There is literally nothing that employers do not like than those people who will not follow directions. An alternative could also include some range of salary instead of some particular amount. How to Deal with Salary History Questions? How can you determine whether it is a salary requirement? If you still want to include the history of your salary, please remember to be honest. 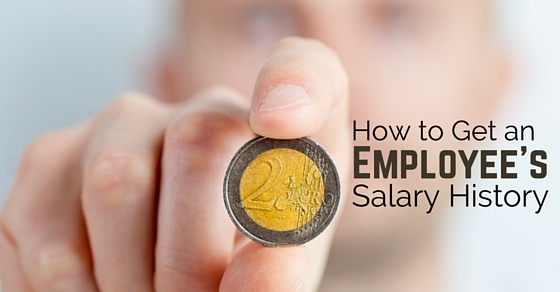 It is very easy for all the potential employers to see your salary along with the other employees. However you may also say that all your salary needs are flexible. This could also help you run in the position and may also give you some flexibility in terms of position along with negotiating compensation some other time. So what do you think is the best way to provide the history of your salary? You may also enlist the history of your salary in a cover letter without having to itemize it. For example you may also say that you are earning in your mid fifties at this point. This will also give you some sort of flexibility whenever it comes to discussing the compensation that you get for any job offer. In case you are concerned that maybe your current salary is a bit too high to knock you down from the position you have been wanting all this while, then you should want to add another salary range rather than some sort of specific amount. Here is one example of a cover letter you should be having with some salary range. You could say your salary is somewhere between 40 thousand to 50 thousand. Or you may also mention that your salary history can be added on a separate history page and added along with the cover letter and resume. Why Do Employers ask for Salary History? Most of them are under the impression that you are looking for a raise. They think you want to make a lot more money than you are making right now. Therefore asking for the history of your salary might not be the right thing. Another thing is that they want to see your salary increase over a period of time. They know that you have steadily improved your salary and would like to see you maximize your best and fullest potential. This brings the post to an end. Hope you have learnt great tips from the article. If there are ideas and comments you would like to post, please feel free to drop a comment below. We would love to hear from you. Plus your questions are also valuable to us. So drop in some of them as well. On that note, good luck!